Save an Extra 25% on your Bathroom Sanitaryware with every Pegasus Whirlpool Bath purchased today! Note: other colours are available, please call for details. Coat enamel with BETTEGLAZE Plus? Water repellant coating makes cleaning easier. Make sure your bath is seurely fixed to the wall. Add a BETTERELAX luxury headrest? Available in either black or white. Add a BETTE Spring Tap? Add an In-line Water Heater? Add an FM Radio Kit inc Speakers? This luxurious bath can be used as a combination bath to take a bath or a shower. BETTE Ocean offers the highest level of bathing comfort, extremely steep sides at the foot end provide ample space to stand. Available with swivelling real glass shower screen. The BETTE Ocean bath is constructed from the highest quality steel enamel and comes with a manufacturer's 30 year guarantee. The BETTE Ocean bath is available in a range of sizes: 1600x700mm, 1700x700mm, 1700x750mm 1700x800mm and 1800x800mm. Pegasus Whirlpool Baths™ new 4th Generation pipework brings hygiene to a new height! Working on the principle of gravity - what goes up, must come down - our new Sensations 4G Whirlpool ensures that every drop of water drains from the pipework, and just to be sure, with every Neptune and Air-zoning whirlpool, the system will automatically purge the pipework with hot air 15 minutes after the bath is emptied, ensuring every last drop goes down through the waste. When the bath is emptied, the pump and pipework will drain completely, but just to make sure that every last drop has gone, the heated blower is programmed to automatically purge the pipework of any remaining droplets 15 minutes after you have emptied the bath. Maintenance consists of flushing the system with our whirlbath cleanser six or seven times a year depending on usage - we include a two month hygiene pack with every system. Whirlpool Bath Cleaner - For regular cleansing of whirlpool pipework. Use every four to six weeks. Whirlpool Bath Sanitizers - For regular sanitizing of the whirlpool bath. 4. Your whirlpool bath has now been effectively sanitized. The Pegasus Pneumatic 4G Whirlpool System is an entry level whirlpool system perfect for developers and home owners looking for a quick and easy way to add value to their property with the addition of a whirlpool bath. Pegasus Whirlpool Baths™ are proud to be British and have introduced our 4G Pneumatic Whirlpool Bath range as a high quality, long-lasting alternative to the cheap, Chinese whirlpool bathtubs available elsewhere online. All of our Pegasus Whirlpool Baths™ are manufactured and water tested by our experienced whirlpool bath engineers, here in the UK. Far from being a cheap alternative, all of our components are sourced from the UK and Europe. The 4th Generation Pipework design and 180° venturi force every drop of water to drain out of the pipework and into the waste, preventing any build up of stagnant water, ensuring total hygiene and peace of mind. Pneumatic 4G Whirlpools from Pegasus Whirlpool Baths UK have a high perceived value at a comfortably affordable price. Our Pneumatic 4G Whirlpool systems are operated by a simple pneumatic on/off control which sends a brisk puff of air to a remote air switch to start the 1hp pump which, in turn, circulates the water around the bath through the jets. The intesity of the water massage can be varied by adjusting the amount of air mixed with the water. This is achieved by simply turning the seperate air control clockwise or anti-clockwise. Less air for a gentle massage to ease stress and strains, more air for easing aches and pains. Pegasus Whirlpool Baths™ are proud to be British and far from being a cheap alternative to other brands, all of our components are sourced from the UK and Europe. The 4th Generation Pipework design and 180° venturi force every drop of water to drain out of the pipework and into the waste, preventing any build up of stagnant water, ensuring total hygiene and peace of mind. What's more is that all our whirlpool baths are manufactured here in the UK by our experienced whirlpool bath technicians and are individually quality tested before leaving our workshop. The Pegasus 4G NEPTUNE whirlpool system features a stunning electronic control pad and has the addition of a Turbo Compressor which forces even more air into the Jets, increasing the buoyancy of the bather and providing a more powerful massage option to ease those aches and pains! Affectionately described as the 'Sugar and Spice' whirlpool, the turbo massage can be turned on and off and increased or decreased by the touch of a button. Probably one of the most relaxing massages is achieved by selecting the automatic wave effect, increasing and decreasing the turbo power automatically. New to Pegasus Whirlpool Baths™ is the Pegasus 4G Air-Zoning Whirlpool. Available as either a massage whirlpool with whirlpool jets for the side, back and feet; or as a hydromassage tub with the addition of air spa nozzles in the base of the bathtub for an all round body massage and a luxurious uplifting effect. The Air-Zoning Whirlpool is divided into three zones (back, sides & feet) which can either run through a sequence by directing all the air to each zone individually; or all concurrently with all zones running together. Air-Zoning Whirlpool Baths open up a new hydromassage experience with up to 11 massage options, 4th generation pipework, wave effect whirlpool and an underwater light! The Pegasus Air-Zoning Whirlpools really have it all! Pegasus Whirlpool Baths™ are proud to be British and far from being a cheap alternative to other brands, the 4th generation pipe work design and 180° venturi allow all of the water to drain from the pipe work, preventing any build up of stagnant water. What's more is all our whirlpool baths are manufactured in the UK by our experienced whirlpool bath technicians and are quality tested before leaving our workshop. We are confident you wont experience many faults in the lifetime of your Pegasus Whirlpool bath and to prove it we're giving you the first 2 years absolutely FREE! All whirlpool bathtub parts are sourced from reliable manufactures in Italy and the UK producing high quality, durable components. Chances are once you've installed your Pegasus Whirlpool Bath, we won't hear another peep from you... other than when you're stocking up on your favourite oils of course! Everybody who purchases a Pegasus Whirlpool Bath gets a free "Hygiene Pack" that contains whirlpool cleansers, sanitisers & an aromatherapy bath oil. Aromatherapy Bath Oils blended especially for use in Whirlpool and Air baths with 3% essential oils. Our promotional offer of choose any 6 and pay for only 5 Aromatherapy Bath Oils is currently on. Click Here to make you choices and purchase more. 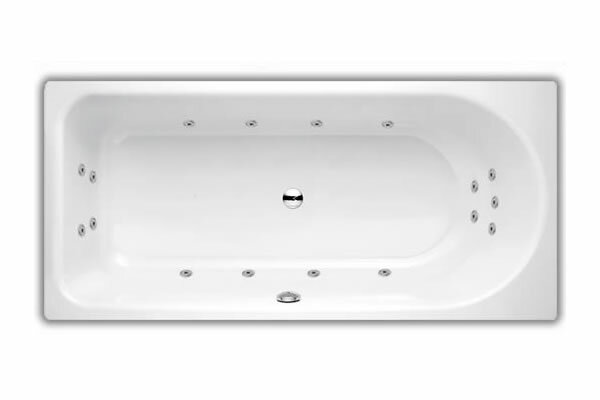 Please Note: Baths and Whirlpool Baths in this range are made to order according to customer specifications and are therefore non-returnable. In special circumstances, returns may be accepted at the descretion of the company however, a re-stocking fee may apply. Images representing the bath or whirlpool bath you are purchasing may differ slightly from the final product.